Last Sunday was Brad’s 40th birthday party. In the invitations, Tasha, Brad’s wife, had asked us to be sure to bring tales about Brad to tell. Sadly, I had to leave before we got around to the story-telling part of the night — I felt bad leaving Susan to get the kids ready for bed on her own — so I promised Tasha as I left that I’d post my Brad story on my blog. Ten-or-so years ago, Brad, Rocky, Alan (a friend of Rocky’s) and I planned to ride the Kokopelli Trail as a two day ride. We planned to ride from Moab to Dewey Bridge the first day, camp there, and then continue to Colorado the second day. Unfortunately, it rained the night before. Waking up and looking at the standing water in the parking lot, I recommended we forget the epic, go back to sleep, and in a few hours go for a ride on Slickrock, which would be dried out by then. Rocky and Alan were right with me. In fact, I think they admired my courage. I had been the brave one, saying what everyone else was thinking — that riding a big mountain bike epic after a big rainstorm was not a good idea. Brad was astounded. We had planned this ride for weeks! We were prepared! The trail was probably fine! Rocky, Alan and I caved. In the face of such enthusiasm, how could we not? Had I known what the day held in store for us, of course, I would have simply murdered Brad on the spot, hidden his body, and gone back to bed, and then gone for the aforementioned ride on the Slickrock trail later this afternoon. And I would have been justified in doing so. The Kokopelli trail begins at the Slickrock trailhead. With three of us (i.e., everyone but Brad) casting a wistful look back at the ride we’d prefer to be doing, we began the ride up Sand Flats Road. Here’s the thing about Sand Flats Road: There’s a lot of it that isn’t sand at all. Oh sure, there’s plenty of sand, but it’s not all sand. There’s also a considerable amount of clay. Usually, you don’t even notice the clay, because it’s all hard and baked and easy to ride on. In fact, it’s much, much easier to ride on than the sand. So, on the 362 days of the year that it doesn’t rain in the hot Moab desert, clay is an awesome riding surface. On the other three days of the year, it’s a bad riding surface. I need to be clear, here. By “bad” riding surface, I don’t mean that it’s suboptimal. By “bad” riding surface, I mean that it was actually wicked and spiteful. And quite possibly evil. And in short, we each had to frequently stop, scraping mud from our bagel-esque tires, scraping mud from our deraileurs, scraping mud from our pedals, scraping mud from our brakes. After an hour or so of this — during which we had traveled perhaps a dozen yards — I announced that this seemed like enough. We could turn around now and still get in a good ride on the Slickrock trail, then go get dinner at the Moab Brewery. The day was not too late to salvage. Brad — who, I’d like to point out, had never done this ride before and had no idea of what was ahead of us — insisted things would shortly get better, and we should go on. Brad must be a Jedi or something, because his mind trick worked. We went on. About 90 minutes later than we had originally planned on it — which is to say, we were going about half as fast as we had expected to — we got to the point where you turn off Sand Flats road and onto singletrack. Ordinarily, this is one of my favorite parts of the ride. While almost all of the rest of the Kokopelli Trail is on wide dirt roads, this feels a little more like mountain biking. But not this day. After the night’s rain, this trail — no, let’s call it what it really is: “ravine” was in some places a soupy mess. In other places it was a running stream. In still other places, it was the exactly perfect material for making adobe bricks, complete with straw already mixed in, so as to make the binding compound stronger, as if that were somehow necessary. Within yards, our bikes were completely immobilized. The only way to continue was to shoulder our bikes and trudge on, hiking for four miles uphill in alternately slippery and sticky mud…in our bike shoes. We eventually reached the pavement part of the ride, which I have never been so glad to reach. On previous Kokopelli rides, we’re usually just getting warmed up — been out a couple hours, just getting into our endurance groove. This time, we had been out six hours. Seriously. He said it was fun. So, in a testament to how weak-willed the rest of us were, we pressed on. Things weren’t so bad as we rode on the pavement for several miles, climbing up to Beaver Mesa. The only difference, being, of course, that we were much more exhausted and demoralized than we had ever been before. Except Brad. He chattered on happily about what an awesome time we were having. I believe Brad may have been on drugs. When we reached the top of Beaver Mesa, the paved road ended, yielding to a good gravel road. This good gravel road lasted for nine inches, approximately. It, in turn, yielded to brownie batter. We were instantly jammed up. Wheels wouldn’t turn. Drivetrains were completely obscured. And since we were about to begin another climb, followed by a descent that would leave us committed to a night huddled in mud — because, as I mentioned, there was no way we were going to make it to camp — I decided to try convincing Brad, one more time. So Rocky, Alan, and I waited, dejectedly trying to get our bikes into rideable condition. Then we waited some more. And then, just to mix things up a bit, we continued waiting. Finally, I — as the person responsible for bringing Brad out on this maladventure — rode on, hoping that I could catch up with him. And what do you know? It worked. Brad came back. “Is it still muddy?” I asked. What Brad didn’t understand, of course, is that the climb continued for another six miles. “We’re going back to Moab,” I said. Dejected for the first time that day, Brad agreed. We took the pavement back to Moab. Rocky, Alan and I, relieved at the certainty we would not be huddling together for warmth in a cave built of mud and sticks that night, were much happier. Brad was glum. He had been having a great day, until this sad reversal of events. It took Rocky and me years to forgive Brad for cheerfully dragging us through 80 miles of mud. I don’t know if Alan ever forgave him. Alan’s not the forgiving type. Of course now, Brad and I are about as good of friends as friends can be. In fact, ten years later, Brad and I still both tell this story. Brad, of course, tells it a little bit differently than I.
PS: 2009 Fat Cyclist Jersey Pre-Order Week Continues: This is Day 2 in the 2009 Fat Cyclist Jersey Pre-Order week. 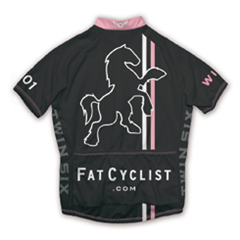 Get details on the jersey here, then order the men’s jersey here, or the women’s jersey here. Thanks. Oh :( That’s so sad! Poor Brad. (Honestly I mean it.) I can see him all sad after being in heaven all day playing in the mud. Glad you didn’t have to sleep in the mud. ps. Is Brad going to tell his version anytime? yes, since it’s Brad’s b’day, i think it would be great to hear his version. don’t you? then we’ll all know that the TRUTH lies somewhere in the middle. I agree, let’s hear Brads version as well! I’m going to suggest a Fat Cyclist ‘training camp’ to either A) The Pacific Northwest or B) The UK. That’ll get you used to riding in mud ;-) It is incredibly demoralizing to be faced with such a challenge and have the cause of your suffering so ‘motivated’ though, isn’t it? WIN Susan! And I hope you’re healing up well, Fatty. I have to agree with Fatty about the Moab mud destroying your bike. Did a race out there a few years ago during the other day it rains in Moab. Bike was caked with mud and it took me 15 mins to clean so the tires would roll! I think it would have been a much better story if you’d followed Brad’s advice. I mean how many of us have had to snuggle our cycling companions during a forced camping trip in the wilds, complete with wollowing in the mud like pigs and trying to start a fire by rubbing two wet sticks together? Fatty, I might buy an OnOne singlespeed and one option is Mary bars – do you still use yours? If so, are they any good? Good luck with the treatment, Susan. WIN! Yeah, let’s hear Brad’s side of the story. I think Brad was all hopped up on CarboRocket! Just got back from the San Jose LiveStrong Challenge….a great and challenging ride. Anyone out there know the Metcalf Road climb??? 1.8 miles at 13.5% average grade with a max of 17%!!!! OUCH!!! Anyway, my jersey order is in, thank you very much, and I am glad to hear that you are healing. Check your email for photos!!! Way to go on the LSC, San Jose, Mike Roadie! I haven’t heard of the Metcalf Road climb, but I can attest that the Bald Peak climb on the Portland Challenge has some serious grade to it as well. I really need to write my Portland LSC ride report. buckythedonkey – i LOVE my mary bars. in fact, i just got a second mary bar — and an on-one carbon fork — to put on the superfly. more about that soon. on-one rules. sounds like you guys suffered a total protonic reversal. important safety tip here egon–never follow brad. that would be bad. “Had I known what the day held in store for us, of course, I would have simply murdered Brad on the spot, hidden his body, and gone back to bed, and then gone for the aforementioned ride on the Slickrock trail later this afternoon. Riding in Michigan after a spring thaw is taboo . . . because of the mud, but I must say that there is very little clay, if any, in most areas, so it’s better mud, if one can say that. dude…i drove on that road this spring after a big rain. i was honestly worried about getting stuck in the sloppy clay and i was in a 4wd vehicle. i can’t imagine ride it in that condition! I am a second witness to Brad’s psychosis on that day. My 23 lb. Ibis Mojo easily ranged from 30 lbs. to 400 lbs., depending on the consistency of the mud. Once we started to descend back into town (the mud on Beaver Mesa was – no exaggeration – a foot deep) it took ten miles of fast pavement descending to remove all of the mud from our tires. In Brad’s defense, he is one of those guys that is easy to hate but impossible not to love. Enthusiasm is contagious. But then so is the plague. I echo the clamour for Brad’s version as I would like a glimpse at the inner workings of a scarred psyche. I should clarify that my only reason for ever hating Brad is that long, grueling, murderous climbs seem to delight him. The harder the work, and the more painful the endeavor, the happier he seems to be. He simply seems never to suffer. Happy 40th, by the way. I learned the hard way that, according to Brad, “Every ride is a great SS ride”. Including Tibble Fork. Ouch. Brad is the eternal optimist….”things will get better just around the corner”. Don’t feel bad about succumbing to his enthusiasm I have been pulled in time and time again for the last 18 years! He has a way. Thanks for being a part of Brad’s 40th party and bringing your special bean dip. It was yummy. Haha, so funny. Mud is a part of life here in the North West. The local bike park has hoses so you can clean the bike after each and every ride! This sounds like most of the “adventures” my husband drags me on. It is the only time, in fact, that he is optimist. Forced marches seem to agree with him. Me? Not so much. When you add water to that clay you don’t get mud… you get spackle. You could have patched the Titanic with that crud. Thanks Fatty – one pair of Marys, sold to the large bloke in the pink jersey. Great stuff – I’ve just spent 9 days in France, and got back just in time to pre-order jerseys! Love the new design, and looking forward to wearing my support for Susan. I live on “Clay Station Road” When I first moved, I thought that was a pretty harmless name. In the last few years I have pulled feet, sucked-off shoes, bikes, my truck, my friend’s cars, strangers cars, and various other items out of the “clay”, otherwise know as “devil mud”. Most of my socks and shoes are stained red. Riding thru that stuff? Cheerfully? Brad was clearly on drugs. Being a huge Brad fan…I definitely would like to hear his side of the story! :) It sounds like an awesome adventure and thank you for sharing! To Brad: You’re awesome….keep on pushing the guys! I do believe you were on drugs…it had to have been Moab playing on your mind! Fatty, Why did you go and have to bring this event up again? I’ve spent the last ten years trying to forget. Now I’ve got to poke my minds eye out with a stick again. You failed to mention that we were subjected to rain, sleet, snow and 20 yards of black ice on the road while doing 40 MPH. And wasn’t there a near miss with a deer crossing the road as we descended. Good times! As for Brad, that is the only time I had ever met him. He probably is a great guy, but I will never know. But you have to respect his optimism and skill. I still hate him.